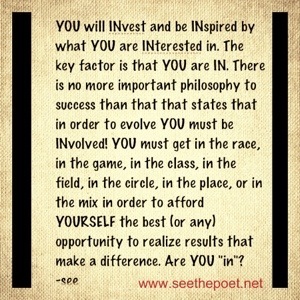 YOU will INvest and be INspired by what YOU are INterested in. The key factor is that YOU are IN. There is no more important philosophy to success than that that states that in order to evolve YOU must be INvolved! YOU must get in the race, in the game, in the class, in the field, in the circle, in the place, or in the mix in order to afford YOURSELF the best (or any) opportunity to realize results that make a difference. Are YOU “in”? This entry was posted in Uncategorized and tagged Drive, Hope, Inspiration, Motivation, Perspective, seethepoet, Truth on July 12, 2013 by seethepoet.